Dokoko District Deputy Chief Administrative Officer Mr. Moses Etyak has allayed fears that service delivery in Dokolo will be affected by the attachment seven vehicles line-up by court bailiff to recover about 400 million shillings awarded to a former employee. The attachment follows a failed agreement between Dokolo District Local Government and the former Senior Personnel Officer Alex Lolo Abura Kawa who sued for unlawful dismissal from his job. 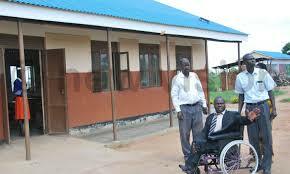 The District Chairman Frederick Odongo aka Kunfu Master (pictured on wheelchair) was this week stranded in Lira town after the court bailiffs confiscated his official vehicle, the first of the seven vehicles to be attached. A negotiation meeting to have the vehicle released failed to take place in Lira after a team representing Lolo Abura did not surface. Asked if the absence of the vehicle and those lined up for attachment will not affect service delivery, the Dokolo deputy Chief Administrative Officer Moses Etyak dismissed the fears saying the district have plenty of vehicles. Asked why they shunned the meeting, Alex Lolo Abura said the district team did not invite him and his lawyer in writing, considering the magnitude of the matter. Six more vehicles including a grader and a tipper lorry are already lined up for attachment to pay the cost awarded by court, according to Lolo Abura.